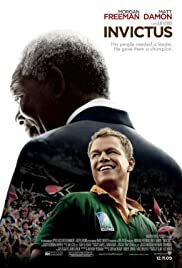 Nelson Mandela, in his first term as the South African President, initiates a unique venture to unite the apartheid-torn land – enlist the national rugby team on a mission to win the 1995 Rugby World Cup. BEFORE: On what is turning out to be a beautiful Thanksgiving day, I will take a brief chunk out of the day to watch yet another Clint Eastwood-directed film, Invictus. Then afterwards lots of time with the family, a 17-pound turkey (and never forget the stuffing), and possibly some Black Friday excursions. But for now, time to travel to South Africa and watch Morgan Freeman do his thing. AFTER: This was an interesting film, not so much because of the film itself but because it was an atypical viewing experience. My plan of finishing Invictus early in the morning before Thanksgiving festivities began did not pan out so it ended up being broken into chunks throughout the day. I don’t think this affects my opinion of the film but this viewing schedule is never recommended. In hindsight I should have just taken today off instead of watching but it is what it is. There is much promise in Invictus but it is squandered on more menial things and it makes for a disappointing film. On the outside this film is about getting the South African rugby team to win the World Cup. And that is what Eastwood focuses on for the entire movie: rugby and Mandela’s (Morgan Freeman) constant fascination with it. Contrast that with a more interesting and much deeper motive for doing that which is to unite the highly divisive Black and White citizens of South Africa. This forgiveness and reunification should be the focus of the majority of the film but instead it takes the sidelines and is hardly mentioned. In it’s place is a completely unnecessary subplot with Mandela’s body guards worrying about assassination attempts (not one attempt in the entire film) in addition to an important discussion concerning Mandela and his personal life but, like the secret service, is glossed over and is inconsequential to the rest of the film. Invictus is a great example of how telling a story in a different way can make a world of difference. There isn’t a lot of conflict in the story and that can’t be changed when it’s based on a true story. But instead of focusing on a different angle, the division in South Africa for example, Eastwood just focused on the rugby and less interesting things because there was a lack of conflict. I’m not saying to invent conflict and start changing things to make a more attractive and pleasing film. What I’m saying is that if Invictus look at its story in a different way, things could have been a lot better. There’s still a lot to like about Invictus. It was quite fun to see rugby being played and hearing Morgan Freeman and Matt Damon speak in South African accents. But overall, the film was very underwhelming especially considering the director and acting talent.